When it comes to keeping your kitchen knives in good working order, it’s imperative that you have the right tools to sharpen them. While you could try a manual sharpener or a simple honing stick, one of the most convenient methods is to use an electric knife sharpener instead. These machines take almost all of the guesswork out of the process, leaving you with pristine edges that will enable you to make the most out of your kitchen knives. Today we’re going to look at the top models on the market and see how they can make your cooking preparation experience all the more comfortable. When picking out an electric knife sharpener, it’s critical that you find a model that will work for any type of blade that you may have. For the most part, knives are broken down by the angle of the edge, which is usually classified as either Asian or European. Asian blades are typically 15 degrees, while European ones are 20 degrees. With this professional sharpener from Chef’s Choice, you can work with both kinds of knives, making it both versatile and reliable. There are three slots on the machine, with the third ensuring that you get a high quality finish every time. That being said, you will want to make sure to utilize the third slot so that you can avoid small burrs on the metal, as well as any imperfections that could affect the way the knife cuts and slices. What makes this sharpener so incredible is that it uses diamond abrasives on the belts. This means that you can shave and reshape each blade meticulously so that it will feel like a brand-new model. Each knife is molded to create a gothic arch structure on the edge, which is both stronger and sharper than most standard blades. Also, it will ensure that you don’t have to re-sharpen your knives very often. The size and power of this sharpener are also excellent, as it won’t take up much room on your counter-top and it will stay in place, thanks to the rubber feet on the bottom. The motor is quick and thorough, and you should be able to get your knives in shape in much less time than you might think. For the most part, electric knife sharpeners are designed for average consumers. By this, we mean that while they will get the job done, they may not provide adequate results for someone working in a more professional setting. However, if you want to get the same improvements to your knives, then you will want something like this sharpener from Work Sharp. What sets this machine apart from the others is that it has a professional-grade belt design. Most high-end knife sharpeners utilize this kind of setup, so you are sure to get the most out of your blades when you use this system. Best of all, there are built-in sharpening guides that will provide you with the best edge possible, every time. Another incredible feature of this sharpener is the fact that you can shape, sharpen, or hone your blades as you see fit. Thus, even if your knives are exceptionally dull, this machine will get them back to brand-new status. Regardless of the angle of cutting (i.e., 15 or 20 degrees), you can restore your edges with this sharpener. To help keep your kitchen clean and safe, this device also has a built-in vacuum to collect all of the metal flakes and debris caused by your sharpening methods. Thus, you never have to worry about tiny shards getting into your food or your body. Finally, to make this sharpening set complete, you also get a ceramic honing rod. Most rods are made of metal, but since this is ceramic, it’s lighter and longer-lasting. It has both a rough and a smooth side so that you can get the perfect edge every time. Also, it has a micro forge sharpener in the handle so that you can smooth out old knives that have a lot of chips on the blade. Overall, if you want a high-end knife sharpener, this is the model for you. You can also watch the video. This video showing you how to use the knife sharpener. The video created by Work Sharp Culinary. We’ve already seen the benefit of having a Chef’s Choice Knife Sharpener in the kitchen, but if you’re looking for something even more high-end and reliable, then you will want to get the Trizor XV instead. This sharpener can help you refine your kitchen knives to make them as efficient as possible. The purpose of this model is to reshape wider 20-degree blades and make them into 15-degree ones instead. Thus, you can take your American or European knives and refine them into highly precise cutting edges. The process only takes about a minute, and you will be impressed with the results. Best of all, once you’ve reshaped your knives, then sharpening only takes about 10-15 seconds each time after that. Simply upgrade everything in your kitchen, and you can keep them in perfect condition without any hassle. What makes this electric knife sharpener even better is that it comes with spring guides to ensure that you get the correct blade shape every time. As with the other Chef’s Choice model, the machine creates a gothic arch edge, which retains its shape and sharpness for longer than other styles. Also, you can sharpen both straight and serrated blades, making this one of the most versatile and reliable devices you can own. For the most part, finding the right electric knife sharpener is usually about maintaining the blades that you have in your kitchen. However, if you have a variety of knives and edges that you use for other things (i.e., scissors, hunting knives), then you will want something a bit more robust for that. This sharpener from Work Sharp is designed to help you out with everything else in your home that needs a precise blade. What makes this sharpener so versatile is its size and customization. It uses a small, high-powered belt to deliver the best results, and you can either hold it in your hand or place it on a flat surface to work. When it comes to customization and adjustment, you can change both the grit of the belt or the angle of the sharpening guide. For example, the fine grit belt will be perfect for honing blades, while a 50-degree angle will work best on hunting knives and other outdoor gear. You can sharpen anything from shears to axes with the same convenience and reliability. If you have any ceramic knives, then you can buy an optional diamond-abrasive belt that will help you sharpen those as well. Because the belts and the guides are so easy to swap out, you will be impressed by how quickly and efficiently you can sharpen everything. Just take a little time out, and you will be ready to go for any occasion. So far, we’ve been looking at some of the most high-end electric knife sharpeners. While these machines are excellent for getting the best results from your knives, they can be both expensive and complicated to use at first. Thus, if you prefer to have a simplified system that is both reliable and cost-effective, you may want something like this model from Linkyo. This knife sharpener is designed to take all of the guesswork out of the experience. Simply pull your knife through on each side, and you’re ready to start cutting and slicing. It’s a two-stage system, with the first section reshaping the blade while the second one sharpens and hones the edges for a perfect finish. Because the sharpener has slots, you never have to worry about putting the blade in the wrong way. That being said, you should never force it through, nor push it back out once you’re finished. Doing this can damage the stones and scratch the knife. For safety, this machine comes with sturdy anti-slip suction cups on the bottom. Also, it automatically collects all of the shards created when sharpening the edge so that they don’t get everywhere. You can pull out the container from the bottom and dispose of the pieces for easy cleanup. Another safety feature is the automatic shut off when too much pressure is applied. This sharpener works well when you pull the knife, so it’s not necessary to push down at the same time. However, if you do, then the motor will switch off, saving both the machine and your blade in the process. The only downside to this sharpener is that it’s not designed for serrated knives, nor will it work on non-kitchen blades, such as hunting knives or scissors. Next, we have another simple and effective electric knife sharpener. This model from Shenzhen Knives is a perfect example of both efficiency and reliability in a cost-effective package. So, if you’re looking for something that doesn’t require a lot of effort but you also want to sharpen as well as the rest of them, this is a decent option. What makes this sharpener better than other simplified models is that it utilizes an abrasive diamond system. This means that you can work on both stainless steel and ceramic blades with ease. Other sharpeners can’t do ceramic knives, so this is definitely a step up in that regard. The other thing that we like about this model is that you can replace the cartridge when necessary. Usually, once the abrasive is worn out, you will have to get a new machine. Fortunately, you can pop out the cartridge, swap it with a new one, and you’re ready to go in minutes. Also, this capability makes it easy to empty the container of metal and ceramic shavings so that they don’t build up over time. As with the Linkyo model above, this is a dual-stage system. It has a coarse and a fine setting so that you can both reshape and hone the blade in one pass. The machine comes with automatic blade settings to ensure that you get the right angle, and it requires little effort to run the knives through to get them as sharp as you need them. If you’re not familiar with the brand name, Wusthof is world-famous for making some of the best German knives around. Thus, it only makes sense to get an electric knife sharpener to keep all of your Wusthof blades in excellent cutting condition. However, as a bonus, this machine comes with the same motor technology as Chef’s Choice, meaning that you can expect the same level of quality, precision, and reliability with this model as any of the other Chef’s Choice Sharpeners on this list. In this case, the machine is designed to reshape your wider angle blades so that they will be much more precise and efficient while cutting and slicing. The diamond abrasives will reduce a 20-degree knife to just 14 degrees, making it even better than most Asian-style edges. You can instantly upgrade all of the blades in your kitchen with this one machine. As with other models we’ve seen, this uses a three-stage design. First, the diamond belt removes excess material and collects it in the bottom of the machine for easy cleanup. Second, the fine-grit belt hones and sharpens the blade. Finally, the third section is there to refine the edge and remove any imperfections so that you get a brand-new finish. The third slot is also ideal for serrated blades, making this sharpener even more versatile. Also, because it utilizes diamonds for sharpening, you can work with both stainless steel and ceramic edges. Overall, if you like the idea of upgrading your knives to be sharper and longer lasting, then this is the sharpener for you. With a high-end motor and a reliable three-stage system, you can expect the best out of your blades. Next, we have another simple and easy-to-use electric knife sharpener. This model from EdgeKeeper looks like a sleek, vintage home appliance, making it an ideal choice for most kitchens. Also, because it comes in a variety of colors, you’re sure to find one that works best for your sense of decor and style. As with other units we’ve seen, this is a two-stage system. It uses coarse diamond-abrasive stones on one side to reshape the blade and make it sharper. Then, you move to the other side and refine and hone it until it’s in perfect condition. This machine will work on most knives, including both European and Asian-style blades. That being said, it won’t reshape thicker edges to be thinner, so don’t try to upgrade your Western knives with this system. One unique feature that this model has is a magnetic cleanup system on the bottom. The magnet collects all of the shavings so that you can keep your sharpener neat and tidy. Simply pull it out, wipe it off, and you’re ready to go again. As we’ve seen, Chef’s Choice is one of the best brands out there for electric knife sharpeners. Thus, it only fits that we close out our list with another winner from this company. We’ve looked at a variety of systems so far, but this final sharpener is designed for Asian-style blades only. Thus, if you have an extensive collection of 15-degree knives in your kitchen, you will want to utilize this model. However, if you have a lot of European (20-degree) blades, this sharpener won’t provide you with the same level of quality and refinement. Nonetheless, it comes with all of the standard benefits that you would expect from this brand. It has non-slip rubber feet for stability, diamond abrasives to ensure that you get the best results, and precision guides to create the perfect edge every time. Also, because the guides are double-sided, you can work with single or double-faceted blades without any problems. When it comes to having the best electric knife sharpener, you want something that is both powerful and reliable. With that in mind, we have two options that we believe stand out from the rest. First, if you want professional-grade sharpening results, you should buy the Work Sharp Culinary Sharpener. We appreciate the internal belt that not only ensures your kitchen knives are up to par but that you get the perfect edge every time. We also like that it comes with a honing rod and an internal vacuum system for quick cleanup. 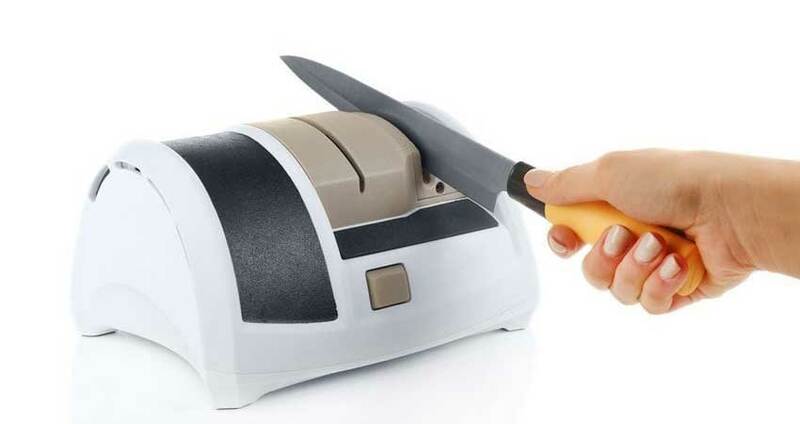 Second, the Trizor XV Sharpener from Chef’s Choice is ideal if you want to make the most out of each of your blades. Because it will reshape your knives to a 15-degree angle, you can slice, cut, and chop with much more precision and reliability. Also, since you can work on both your European and Asian-style blades, it’s an excellent choice for almost anyone. Best Milk Frothers – A Barista’s Guide! 😮 The Work Sharp E5 comes with standard 17 degree guides. With an additional $50 kit, the sharpener can also accommodate 15 & 20 degrees. 😮 The table is wrong for the Trizor XV (sharpens to 15 degrees) and the Wusthof 3-stage PEtec (sharpens to 14 deg). The table specifies 20 for each. 😮 The Work Sharp Knife & Tool lists sharpening angles as the total (combined) angle. To get accurate angles, divide by 2. It handles 20, 25 & 32.5 degrees, which is great for hunting knives and garage/shop blades but not so great for the kitchen knives. 😮 You failed to mention the downsides of changing from a traditional 20 deg to 15 or 14 deg. The narrower the angle, the better quality of steel (mainly hardness) that’s required to maintain an edge. Harder steels are more brittle, making them prone to chipping and less forgiving of hitting bones, dropping or failing to use an appropriate cutting surface.